This handmade hand and body lotion is very light and easily absorbed by your skin. I love how this lotion leaves your skin feeling hydrated with a soft powdery feel. A little bit really does go a long way! LAVENDER - Everyone's favorite relaxing scent! French lavender mixed with a hint of fresh herbs and cool camphor. A beautiful lavender scent. Lotion INGREDIENTS: distilled water, sunflower oil, soya oil, vegetable glycerine, stearic acid, cetyl alcohol, emulsifying wax, palmitic acid, tocopherol, potassium sorbate, meadowfoam oil, jojoba oil, goat's milk, aloe vera, vitamin C, citric acid, fragrance, germall plus. I live on Cape Cod, MA and make my cold processed soap and lotions out of my little home based soap studio. Cape Cod is known for it's quaint villages, beautiful beaches, and windswept sand dunes. 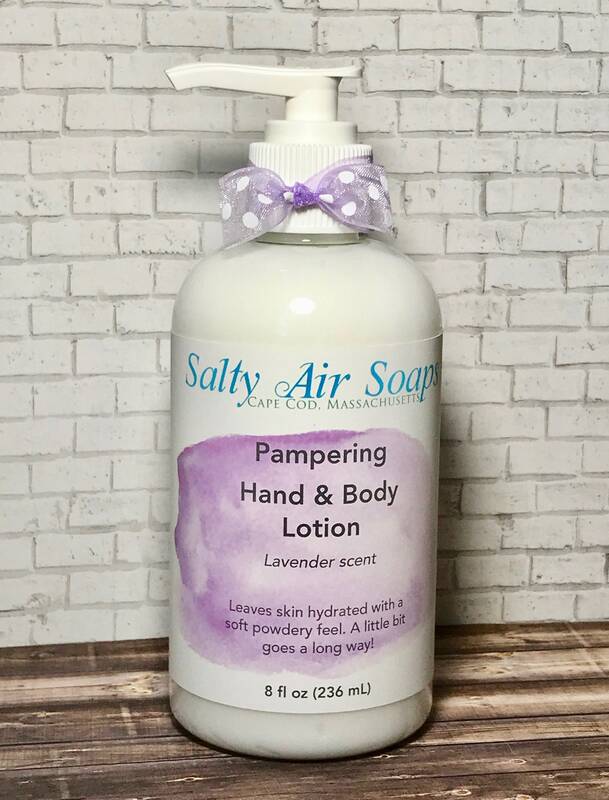 SaltyAirSoaps accepts all Etsy payment methods. All my listings are for products which have already been made, cured for at least 4 weeks, and been packaged. I do my best to carefully wrap and drop off your purchases to USPS within the next business day. LOCAL PICK-UP: If you are local to the Sandwich, MA area and would prefer to pick-up your order instead of paying for shipping, please message me before placing your order. That way, I can process your order without charging you for shipping and we can set up a time and place for pick-up. Feel free to email me at: sasoaps@gmail.com as well. My goal is for every customer to be completely satisfied with their purchase. If for some reason your purchase is not completely as you had hoped, please message me so I can do my best remedy the issue. Thanks! Please keep in mind that all my soaps and products are hand-made, cured during New England's constantly changing weather, and hand-cut. Therefore, there may be slight differences in texture, color, and weight from one bar to another.